Well, isn't this a pleasant surprise. According to Nintendo Japan, Rockman 2: Mystery of Dr. Wily will release on the Nintendo 3DS Virtual Console on August 8th for 500 Yen (roughly $6.30). This is a very quick release, I might add. The original Rockman just hit the Japanese eShop no less than three weeks ago! For the record, this is not a 3D Classic version. Yes, Nintendo experimented with that in the past, but this is not that game. What we've got here is your run-of-the-mill Virtual Console port. And there's nothing wrong with that! They're releasing them pretty quickly on the 3DS it seems. If only things went that quickly for the rest of us, especially with the remaining stuff not on the Wii's VC. I'd like to think this means that Capcom will be fairly speedy with re-releasing the NES games on the e-Shop, but I'm pretty sure they'll start stalling after they get up to 3 or 4, then take forever to finish off the series. Same thing pretty much applies for the Game Boy games. These aren't even 3D Classics right? So they're just straight up roms basically? Yep. They're your run-of-the-mill Virtual Console ports. ive noticed the japan 3ds virtual console has a much better game selection then the american 3ds virtual console, why can't any of these games get released on the us virtual console? a similar thing happened with the virtual console on the wii in japan, their wii virtual console selection stomps all over the us wii virtual console selection. They discontinued the 3D Classics line because they ended up taking like 10 times more time and resources than they had expected. Oh, well. It's not as if the 3D version would have been any better, anyhow. It'd still be the exact same overrated game that people have already played to death. Except a 3D version would have made it a little more worthwhile and different, to people who are into that I guess... Not me though. 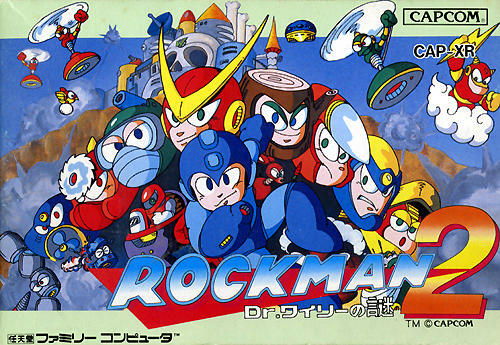 Like Shin Star mentioned, I kind of wonder whatever happened to the "3D Classics" version of Rockman 2... Ah well. That is completely incorrect information. Nintendo never said anything about canceling the 3D Classics line. They talked about how 3D Classics take a long time to make, but not a word was said about cancellation. 3D Classics: Kid Icarus just came out a scant few months ago. Come on now. Where's this 3D version that was talked about some time ago? I hope this will be a 3D classic. Wouldn't be surprised if it wasn't though. Just Mega Man 2. @Joseph: Remember, people who played this game post-hype don't see it as being awesome. I actually am not a big fan of MM2, since I see it as a mess of game mechanics. Perhaps my background as someone who's trying to be a game producer has spoiled that view a bit, but... well, when I see one weapon that can take out half the game, my general views on it are "What were they smoking?" I can't say that I agree with that, but hey. To each their own. Nonsense because they are already on Wii Virtua Console.. Why again on 3DS ? They are looking for double profits, jeez. Oh well. All right, but don't forget there's still at least three more Mega Man games left to release on the Wii's VC, Capcom. Megaman 2 is one of my least favorite game of the series, but I'm at least glad we're getting another game. I don't really care much about megaman 2 being on the 3ds because I already have it on the anniversary collection for the ps2 and i still have my original nes copy I bought in the mid 90s. I'd really like to see megaman v/ rockman world 5 for gameboy released on the 3ds virtual console because that was a very unique and awesome megaman game that not too many people have gotten to play because of how hard to find it is. @Fantasy Empress Rolina: As much as I agree with you on how overrated MM2 is, you kinda have to give its mechanics a break. MM2, and MM1 for that matter, were both early and experimental titles. Yes some of its mechanics are indeed quite broken, but it's not quite as chalky as MM1's was in my opinion. MM1's mechanics, I've always kind of viewed it as the black sheep title of the Classic series even though it was the game that started it all. There was always something that bugged me about it, but I can't quite say what that was. "I actually am not a big fan of MM2, since I see it as a mess of game mechanics." Yeah, including shoddy, piss-poor level designs and object placement. Up to this day, I'll never understand this game's hype. Also, yeah. I think Axem White summed it up pretty nicely. Ignoring how overrated the game is, the 3D version wouldn't have been worth the money, either, since it's just the exact same game with the 3D feature enabled. Not very impressive. Oh, and to anyone who wants to complain about my opinion, piss off. If everyone else has the right to say what they please about this game, then so do I. What on earth makes Mega Man 2's level design "piss-poor"? You're taking your hatred just a little too far. Don't let the fact that it's an entirely over-played game pull a curtain over your eyes. The game isn't bad in any regard, it just doesn't live up to the way people paint it. Much like Halo, Call of Duty, and Final Fantasy VII. Alright, so maybe that wasn't exactly the best choice of words, but at the same time, I still don't think they're all that great. Flash Man's, Crash Man's stages, as well as the fourth Wily stage, in particular, definitely had poor object placement in some instances. Those weren't the only ones, but those are some prime examples. I think Mega Man 2 deserves all its accolades and that a lot of Mega Man fans are too overly critical. However, many Mega Man installments after 2 honestly trumped it, and I'd wish they would get more attention instead. To be fair, I probably don't play the game like other people do. I pretty much avoid Metal Blade. And actually, I just play through using the buster. I've also got Heatman's Yoku Block pattern down fairly well. But, to keep an open mind, I think I'll spend a few days playing through and analyzing the first nine classic games (since there's no convenient way for me to play through the Inti Creates games at this time, short of hijacking a Wii...), using all the weapons and playing like the average person (who knows the weakness rotations and such) would, and try and see it from your standpoint, as well as Axem White's and Krazy Monkey's. I could easily be wrong about Rockman 2 being a good game. I think it would just be better to stop complaining about MM2, because it's starting to become no different from people overly praising the game. No really, give that one a thought. And FYI, some of the later titles are also overrated. I personally find MM3 to be just as overrated as MM2 is. "And FYI, some of the later titles are also overrated. I personally find MM3 to be just as overrated as MM2 is." Maybe, but you don't see that game (or any other in the series that came afterwards) getting milked even half as much. What I did was I ran the game with the M68K CPU overclocked. Usually, this would completely destroy the timing of a game. However, since Megaman: The Wily Wars was supposedly coded in unoptimized C++, all it did to that game was make it run with absolutely no slowdown whatsoever! Naturally, this catapulted the game to being my favorite port/remake of most any game, even with its little flaws here and there. Anyway! Now that I've replayed the first three games on the NES and really paid close attention to detail, I can honestly say... Megaman 3 made the first two games look pretty damn amateurish by contrast. Don't get me wrong, the first two games are by no means crap... but for the first time, I can clearly see that, compared to Megaman 3, those two games are pretty damn lame. Sure, the second game improved on the formula... but the third game revamped it considerably, with faster gameplay, higher-quality music, all the major bugs from the first two games fixed, and a few other things. You know, though? As much as I love Megaman 3, I'm hoping that something really catches my attention as I play through the next six games in the series. I'd love to find out that all this time, 4, 5, 6, 7, 8, or & Bass are even better games. Memory says they're not as good, but then memory said, up until today, that Megaman 2 deserved all the praise it gets. And it totally does not. Megaman 3 made the series what it is today, or at least turned it in the right direction. Not 2. Oh, I agree for sure. Flash Man's stage is probably the most boring, straight-forward Mega Man level in history, but it hardly ruins the game. I just don't personally see half as much bad in the game that you do. It was the first title to see eight robots, to have an intro, and other things. I'm sure I don't have to tell you all that though. I -do not- disagree with you that Mega Man II is completely overblown but I don't let that effect my own opinion and love of the game. It gets far more recognition than it deserves but it's still an NES classic and we owe much of what we love about the franchise to it. Mega Man 2 deserves such harsh language directed towards it just as little as the praise it receives from the other side. It's still a good game with memorable robot masters, fun boss battles, and excellent music. Disregarding the massive overhype, a lot of Mega Man 2's shortcomings as a game can be blamed squarely on Capcom management forcing the developers to make Mega Man 2 on their own time and in only three months. That's horrible (yet considering the sales of the first game, understandable) of them but considering these limitations I'd say Mega Man 2 turned out terrifically. And yeah, the later games absolutely one-upped it in practically every way. True dat, brother. I loved MegaMan 2 as well, it was a little bit hard, but the gameplay and E Tanks and 8 Robot Masters and the famous Wily Stage music that inspired the Okkusenman songs made me loved MegaMan 2 as much as the next guy. People say that MM2 is overrated, but that's their opinions. They shouldn't try to turn their opinions into facts. We need to respect each other's opinions. Glad to see that MegaMan 2 is gonna be on the 3DS VC. People can still argue that MM2 "made the franchise it is today", because let's face it, if MM2 wasn't successful back then, there would be no way that Capcom would have made a third title. Heck, MM1 brought them enough uncertainty as it was.